I stumbled across an impressive app the other day that I’ve been dying to share with you. Our kids love the silver screen, don’t they (and now-a-days all screens are silver)? Even on Sundays, our designated screen-free day for the kids, Noah (6-Down syndrome)signs “watch” with a hopeful gleem in his eye at least 20 times. Every day except Sunday, then, you can find Noah spending at least some of his iPad time on ABCmouse, which you can find here at the App Store: https://itunes.apple.com/us/app/abcmouse.com-26-z-music-videos/id586100697?mt=8. From this screen, your child chooses which letter he wants to watch the video for. The video/songs are lively, set to different types of music, and full of words and sounds that begin with the letter selected. 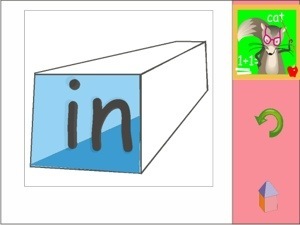 The colorful cartoon graphics are just right for the typical 3-year-old child or any-aged child beginning alphabet work. Here is a shot of some of the video; notice the kids will be getting the sounds of the letters as well as the words on the screen – a great combo for early literacy. The best part? Definately all the opportunities for Noah to imitate the silly little sounds on the videos that get him practicing different phoenemes. It does this momma good to hear silly sounds coming from the other room that I didn’t have to conjole out of Noah. A close runner up to the best part would be the fact that the entire app is free. Your child starts off only being able to access the first few letter videos, but he collects “tickets” from each video he watches which he can then redeem for more videos. If your impatient and want it all and want it now, you can purchase the additional videos, but my kids have actually been having fun “buying them” with what they’ve earned using the app. I don’t know if this app is going to remain free, so drop everything (except your iPad) and download today! 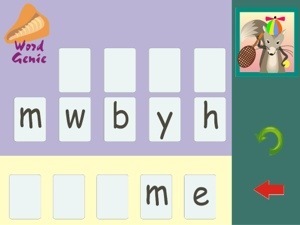 In the “Learn” mode, the SnapWordsA app addresses visual learners by presenting 59 words from the Dolch list of sight words in pictorial flashcards that demonstrates the word in a context-based picture. Note the squirrel in the upper right-hand corner. This is Noah (no relation to Noah here at www.wordsofhisheart.wordpress.com), your guide who remains on the screen to provide help at any time in the app). Next, the picture fades out while the print remains. As a pleasant and expressive voice reads a sentence using the word in context, the sentence appears beneath the word. In the sentence, the specified word is in all caps, which means the word appears both in lower case and capitalized. Then the screen advances to the next word on the list and the process repeats through all 12 of the Level 1 words: a, and, at, by, go, in, is, me, no, not, on, the. There are five levels in all, and only one level at a time is used. Levels must be unlocked by passing a quiz, and once they are unlocked any unlocked level can be selected at the beginning of each session. At the end of the list, there’s an encouraging “Yay” as points in the form of coins fall from the sky. The points can later be redeemed for “stickers” to be placed on an on-screen scene. Tapping the “shop” button symbolized by a shopping cart, your child will enter the screen reward scene mode. Each of the five levels has a unique reward scene and stickers. 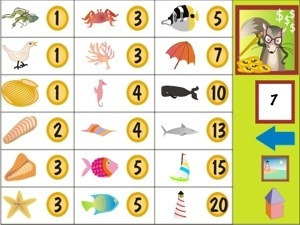 Below is the “catalogue” for the stickers belonging to the beach scene in level 1. Next it’s time to hit the games. There’s Go Fish, Bingo, ABC order, select the missing word, a rhyming game and a Word Genie. These are all great ways for your child to review the words they just learned. 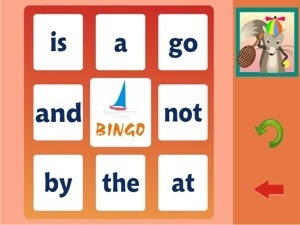 Learners with special needs require repetition in learning new skills, and they will find these games go quickly. Each game offers more opportunities to earn points. Highlights: According to the research on how children with special needs learn to read, the concepts behind this app are right on. 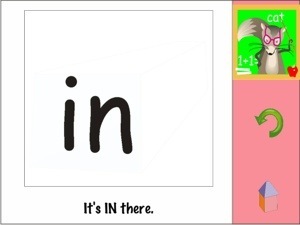 The idea of combining letters and words with features of real-life objects and faces has found its way into several very successful reading programs, most notably Zoo Phonics. The variety of activities mean each child is learning and using the words multiple times and applying their knowledge in different applications over a short period of time. Children should know the words presented inside and out by the time they make it through the games. I love that there are only 11-12 words per level – perfect for short attention spans. Incentive points are earned at short intervals along the way through this app. Anyone familiar with ABA therapy knows the value of providing frequent and consistent motivators. The Word Genie is an especially effective game. A word appears at the bottom of the screen, and letter cards appear above. The word is spoken and then the player is told to change a word like “me” to a word like “be” which only requires changing one letter. Then the player is told to, in this case, change the “mmm” to “buh.” The player points and drags the letter M to an empty card and drags the letter B to where the M originally appears. 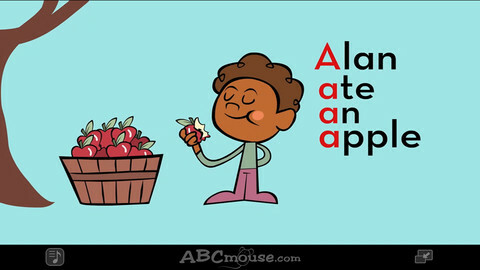 This is a great technique to combine letter sounds, rhyming words and alphabet recognition. I dislike the fact that this game uses some nonsense words in order to practice all the targeted letter sounds. I prefer a real word approach. The screens are clutter-free with basic no-frills graphics. The speed of the slide show in the learn mode is adjustable as is the volume of the background music, a nice feature for parents and teachers who may want to customize. Up to four children can be tracked on the regular version of this app. 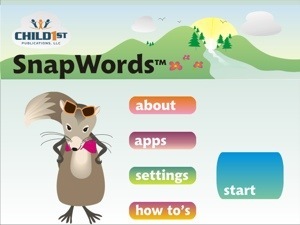 Teachers may want to opt for SnapWordsAClassroom to track a larger number of students. What I would like to see improved: I found the Go Fish game to be confusing, and if it’s confusing for me when I know how to play Go Fish, I’m pretty sure it will be confusing for my kids. The alphabetizing game seems a bit out of place. My children don’t learn to alphabetize words until much later than they learn to read. Then again, that does make this App useable for a larger age range. Who knows, maybe alphabetizing words could be taught alongside early literacy. That exposure would certainly be an advantage when the child gets to the point in curriculum when alphabetizing is typically taught. While the graphics for the flash cards were top notch, I found the graphics for the games, “stickers” and reward scenes to be rather uninspiring. I’d like to see something more cutesy. Educational app developers have a big job in making screens appear fun without causing undue distraction. I’d opt for a little more cuteness. You will find this game delivers educational value without a lot of fluff. For parents and teachers who want a maximum amount of education with a minimal amount of time on the iPad, SnapWordsA is a good choice. It is important to note this is not an entertainment app, but I do think children who like being on the iPad will enjoy it. I’ve had trouble uploading a picture of my kids from my iPad to the log in page, although it was easy to take a picture within the app and use it. Noah (6 with Down syndrome) – The only feature Noah was ready for was the learn mode, but he was attentive and even said and signed some of the words along with the program. For a child with severe language delays, this was a big plus. Bella 4 – This app seems to be right at Bella’s level. She is pretty serious about reading these days and was able to work through most of the games. Andres 9 (Chiari malformation and mild sensory integration issues) – Andres actually had fun with this app. He is a good reader, but the games on this app required him to listen to directions and slowed down the reading process. The combination of auditory and visual processing required to do the activities makes this a relaxing but profitable activity. Value: I have mixed feelings about the value of this app. The variety of lessons and games means instead of having to buy several smaller apps, this app covers several bases. For $9.99 I would like to see more flash, more polish. Good, educationally sound apps can be expensive to develop, and I know costs must be recouped. I think in this case, you’re paying for not just the app but also the research behind the app. If you want to feel a little better about the price, check out the expense of trying to buy hard copies of materials like these. The good news is the friendly folks over at Child-1st Publications, LLC, not only provided me with a copy of the app to review, but they also sent me two additional codes to give away to my readers. And guess what? If you’re seeing this, you’re a reader. Leave a comment below, and on Friday, February 8, 2013, Noah will pick out two lucky numbers to match up to the order of comments and I’ll email the codes to the winners. Don’t have an iPad? Enter anyway – these codes are fully transferable – or send a link to this post to your favorite iPad owner. Andrew and I watched Walk the Line (the Johnny Cash story) the other night; and between the music, the drama and the incredibly sad story of Johnny Cash, and the incredible love of Johnny Cash and June Carter, he’s been on my mind ever since. I decided I wanted some Johnny Cash music for Christmas. Oh my, there’s so much to choose from. The wonders of modern technology (the Internet) allowed me to sample most of his albums, and then I realized I don’t have to ask for CDs. I’m only using about 10 percent of the power of my iPad. I can use iTunes and use it as a music player. So, of course, I just had to go ahead and download an album to make sure it works. And it turns out the speakers on my iPad are pretty good. And now I own Johnny Cash – Bootleg, Vol.IV – the Soul of Truth. Yee haw! It seems to be all gospel. And oh my gosh, he’s amazing. So, I’m thinking of scratching off speakers for my iPad, and a Johnny Cash CD. What’s left? Chocolate. Hey, I’m easy to please. What’s on YOUR (not your kids’) Christmas list this year?